Lotus Vine Journeys offers powerful, l4 day Ayahuasca retreats in Peru where our guests can experience the healing powers of Ayahuasca, Yoga and Buddhist based meditation at a luxury eco-lodge. authentic, professional & comfortable environment available. If you are interested in visiting Lotus Vine Journeys, please check out this video featuring our retreat center in Tarapoto, Peru. Choosing where and with whom to undertake an Ayahuasca retreat in Peru can be a difficult decision. We want to outline four fundamental areas that were decisively important to us when founding Lotus Vine Journeys... We work hard to stand by them and continually improve. Our retreat programs, of 14 days with seven ceremonies, is generally considered to be a lot of medicine for a short period of time. They are designed for those who want to 'do the work' and take every opportunity the plants afford for deep transformation. As such, we put great care into your daily itinerary and retreat schedule. Practiced over years of experience, we intertwine the intensity of ceremony with the need to rest; to explore; to stretch; to admire; to be; to process; to sing and to integrate. 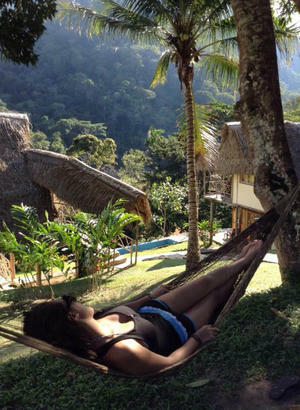 Our ayahuasca retreats can be extremely transformative, and we know that such work also requires the need to experience stillness and solitude. By combining plant spirit medicine with heart-centered, body awareness meditation practices (known as Vipassana in the Buddhist tradition), we are better able to support our guests in receiving an accelerated spiritual, emotional, mental and physical cleanse of their entire system. Regardless of faith, we have found that Buddhist psychology and practicing of these techniques throughout your Ayahuasca retreat assist greatly with the reconnecting and realignment with "source" ... the common goal of many ancient Shamanic traditions. According to the Shipibo, there is a time-honored tradition of following a special diet to prepare oneself for the healing energies of Ayahuasca. There is a discipline and commitment that is called upon. Lotus Vine Journeys places an enormous emphasis on providing you with a fresh, delicious, nutritional and comforting selection of foods (both raw and cooked) that adheres to this discipline from an exclusively plant-based perspective (with the exception of eggs for breakfast). We have passionately instilled in the cooks at our chosen lodge a great pride in providing you with foods that open the potential of your journey inwards during your Ayahuasca retreat here in Peru. The great majority of Ayahuasca retreats in Peru are located deep in the jungle lowlands of the Amazon Basin at purpose-built Ayahuasca camps. We choose to host our retreats at a restful, safe and secluded Amazon Lodge in Tarapoto, Peru. Here you are lifted out of the basin to the narrow band of cloud rainforest that flow into the Amazon. This accessible and extraordinarily bio-diverse region offers many things the basin does not ... stunning views, waterfalls, refreshing breezes and colorful sunsets. In addition to this, our lodge is connected by a road to Tarapoto. As such we can offer you those little luxuries more typical of a hotel environment ... wifi, reliable hot water showers, electricity (lights and fans), room service, large comfortable beds along with various pool and lounge facilities. We can accommodate all room requirements for couples, those traveling with friends, groups and those journeying alone. Our organization, what drives us and what others have said. Contact us to reserve your adventure within. All photography on this site is provided by our generous hosts, previous participants and our dedicated community of facilitators... we thank-you!